Pleasanton, CA — August 23, 2018 — NextHome is proud to announce our newest addition to the franchise, NextHome 180º Realty. The brokerage represents the fourth office location opened in the state of Georgia for the NextHome franchise. The company will be owned and operated by husband and wife team, Sylvia and Adam Myers. Sylvia will be the broker of record and handling all day-to-day sales and agent leadership duties, while Adam will serve as the Operations Manager for the brokerage. Based in Warner Robins, NextHome 180º Realty will provide real estate services such as single-family residential sales, first-time home buyers, second homes, investment, luxury, veteran and military relocation, and land deals for the cities of Warner Robins, Perry, Bonaire, Macon, Kathleen, Centerville, and the remainder of Houston, Bibb and Peach Counties. The city of Warner Robins is located 90 minutes southeast of Downtown Atlanta and is home to approximately 70,000 residents. The city features Robins Air Force Base, which is the largest logistics Air Force Base in the southeast United States. Sylvia is a graduate of Middle Georgia State University and holds degrees in both Business Management and Information Technology. Licensed since 1997, Sylvia has been a longtime top-producing REALTOR® in Georgia. She worked for 3 years as a RE/MAX agent. In her first full year in real estate, she sold nearly $3 million in volume where the average sales price was $120,000 at the time. In 2000, she opened Hometown Realty, where she was the broker/owner of the business. After building up a successful brokerage, she sold the company a few years later and moved to EXIT Realty where she served as the sales manager for the brokerage. Sylvia met Adam in 2004 and the couple married in 2014. Adam is also a graduate of Middle Georgia State University and holds a degree in Psychology and Public Service. With Adam’s background and education, he is excited about leading the operations for the brokerage and helping agents be as productive as possible. He is also the owner/operator of 180 Home Construction, which will provide inventory for the brokerage. Managing 20 to 30 rehab construction projects a year, Adam’s vast experience in construction will be a huge asset to the brokerage. When Sylvia and Adam started the discussion of going out on their own, they had already kept an eye on the NextHome franchise for some time. NextHome 180º Realty will be a community resource to not only help people buy and sell homes but offer information on the entire process. The agents will provide valuable education that will make their clients feel knowledgeable about the entire home buying and/or selling process. Sylvia and Adam are committed to helping their community. They have participated in several Habitat for Humanity home builds and are very active within their church. When not selling real estate, the two of them are very involved in the world of gaming. They are prominent online players of World of Warcraft and enjoy the online interaction with players from around the globe. Sylvia is also an author and has a children’s book scheduled to be released in fall of 2018. Please join us in congratulating Sylvia, Adam and the rest of the team at NextHome 180º Realty on the opening of their new NextHome office in Warner Robins, GA! Pleasanton, CA — August 17, 2018 — NextHome is proud to announce our newest addition to the franchise, NextHome Premier Homes Realty. The brokerage represents the 20th office location opened in the state of Texas for the NextHome franchise. The company will be owned and operated by real estate broker Rita Zarghami. Rita will be the broker of record and in charge of all day-to-day operations. She will be joined on the leadership team by her husband, Keyvan, and Virgie Calligan-Green. Keyvan will serve as the Vice President of Operations for the brokerage, while Virgie will be the Office Manager. 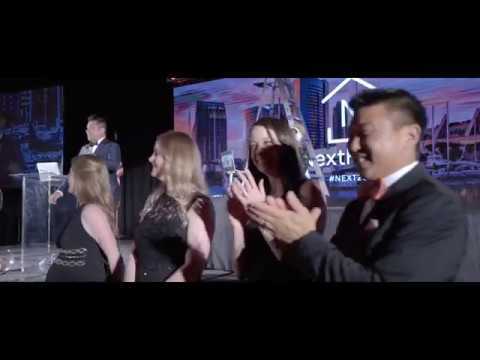 Based in Humble, NextHome Premier Homes Realty will provide real estate services such as single-family residential sales, first-time home buyers, second homes, investment, luxury, and land deals for the areas of Humble, Lake Houston, Atascocita, Kingwood, Crosby, Porter, Huffman, North Channel, and the surrounding areas of Northeast Houston. Humble is located 20 minutes north of Downtown Houston and is home to approximately 20,000 residents. Licensed since 1994, Rita has been a longtime top-producing REALTOR® in the Houston area. After nearly ten years of high-volume sales, Rita opened her own brokerage in 2003 – Red Stone Realty LLC. Under her leadership, she built the brokerage with talented agents to see annual sales in excess of $25 million. Additionally, Keyvan also opened a mortgage company, 1st Community Mortgage Group, concurrent with the opening of the real estate brokerage. The mortgage company was just as successful with more than $20 million in volume annually. During the recession in the late 2000’s, Houston and surrounding areas were hit extremely hard. Pivoting to adjust to the market conditions, Rita agreed to take over as the Sales Manager for the local Humble Century 21 brokerage, while still actively producing as a selling REALTOR®. Managing 20 agents, Rita guided the brokerage to a very productive office in the midst of an extremely challenging financial time for the state of Texas. In 2013, Rita went back to running her own brokerage. Changing the brokerage name to Premier Homes, she grew the company to 1o REALTORS® and a large portfolio of listings. But Rita knew she needed more to provide to her agents. After doing her own research and sharing the info with Keyvan, the Zarghamis reached out to NextHome and spoke with NextHome’s VP of Sales, Charis Moreno. Rita says the NextHome Premier Realty difference stems from the company’s five core values: Spiritual, Family, Business, Financial, and Personal. When not selling real estate, Rita and Keyvan look forward to spending time with their family. They have three children – daughter Akila, and two sons – Jeremiah and Keyvan Keyanoosh. They also have five grandchildren – Joshua, Jacob, Isabela, Kaiden, and Jackson. Rita loves to cook for the family, while Keyvan is a Corvette enthusiast and attends as many car shows as possible. Please join us in congratulating Rita, Keyvan, Virgie, and the rest of the team at NextHome Premier Homes Realty on the opening of their new NextHome office in Humble, TX! Pleasanton, CA — August 3, 2018 — NextHome is proud to announce our newest addition to the franchise, NextHome City Realty – Detroit Branch. This is the second location for owner, Paul Mychalowych. The brokerage represents the tenth office location opened in the state of Michigan for the NextHome franchise. As a 14-year real estate veteran, Mychalowych is one of the top-producing REALTORS® in the area. He will also serve as the broker-of-record for the company. NextHome City Realty – Detroit Branch will provide real estate services such as single-family residential sales, first-time home buyers, investment, luxury, short sales, probate sales, and land deals for all areas of Wayne County including the Grosse Pointe Markets as well as every city up the Woodward Corridor to NextHome City Realty’s Birmingham Location. With a population of just over 4.3 million residents, the city of Detroit is the largest in the state of Michigan. In 2018, Detroit’s economy has seen a huge boost as many of the neighborhoods affected by the 2008 recession are now beginning to stabilize. With a 30% increase in average sales price in the past 12 months, and a successful launch in March 2018 of his first location in Birmingham, MI, Mychalowych felt it was the right time to expand his business into a second location. In 2009, after years as a top-producing REALTOR®, Mychalowych decided to open his own brokerage, Birmingham Realty LLC, in downtown Birmingham. As the broker of a successful office, Mychalowych did not rest on his laurels. Mychalowych had many reasons behind his decision to partner with NextHome. “I wanted to provide more value to our agents with better branding, additional technology, technology leveraged training, and tools that would help them save time and make more money,” said Mychalowych. As he was researching franchise options, he was specifically looking for a company that provided a plug and play option that was affordable, yet provided a lot of value. Mychalowych said NextHome City Realty is just the beginning of the expansion of his office footprint. “I see us growing throughout the Detroit area very soon,” added Mychalowych. When not selling real estate, Mychalowych focuses on family. The Mychalowych’s have been married for 27 years and have two children – daughters Madison (age 18) and Brooklyn (15). The family enjoys spending time relaxing at their lakefront home and in Northern Michigan. Please join us in congratulating Paul and the rest of the team at NextHome City Realty on the opening of their second new NextHome office in Downtown Detroit, MI!